Anyways here is the list! Potatoes: When too cold, starches found in potatoes turn to sugar, yielding an off flavor. Keep potatoes stored in a paper bag in a cool, dark cupboard or drawer. Same goes for sweet potatoes. Honey: Your luscious honey will turn to crystallized gunk if it is stored in the fridge. Store it at room temperature and out of direct sunlight for happy honey. Tomatoes: Tomatoes actually start losing their flavor and become quite mushy if left in the fridge. Leave on the counter and use when they have a slight give to the outside skin. Apples: Apples, just like tomatoes, start to loose flavor and texture after spending time in the fridge. Leave them on the counter, and toss them in the fridge for 30 minutes prior to eating if you want a crisp bite. Onions: The best place for onions is in a paper bag in a cool, dark cabinet or drawer. If stored in the fridge, they soften and impart an oniony scent on nearby foods. Peanut butter: Peanut butter does just fine stored in a cool, dark cupboard. Bananas: Leave those bananas on the counter, and if they turn brown before you get to them, toss them in the freezer to make banana bread at a later date. Most oils: Pretty much all oils are safe to store at room temperature. 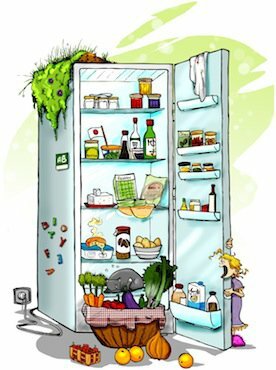 If the oil has a lower saturated-fat content, such as safflower or sunflower, it will benefit from being kept cool, so store it in a dark cabinet or the fridge door. Avocados: Store avocados on the counter and any leftovers in the fridge. But they’ll lose flavor, so it’s a good idea to use a whole one when making the cut. Peppers: Red, green, yellow, and even chili peppers are just fine stored in a paper bag in a cool cupboard or drawer. Winter squash: Acorn, spaghetti, and butternut do best when stored at room temperature. Citrus: Store oranges, lemons, and limes at room temperature on your kitchen counter. Just be careful not to bunch them too closely, or they will tend to mold. Berries: Fresh berries already have a short shelf life, so leave them out of the fridge and eat them within a day or two of purchasing. Melons: Most melons do best outside the fridge. Once refrigerated, they tend to break down and become mealy. After cutting, if any are remaining, store them in the fridge. Ketchup: Yup, your ketchup is just fine in your pantry — even after it has been opened. Because of the amount of vinegar and preservatives, it will do just fine (think ketchup packets at your favorite fast-food restaurant). Jam: Due to the high amount of preservatives in jams and jellies, they are also OK to store in the pantry after opening. Stone fruits: Stone fruits aren’t friends of the fridge, so leave them on the counter until they’re ripe, and then eat. Pickles: Another item high in preservatives, mainly vinegar, pickles will stay crisp in the pantry. But, if you’re a fan of cold ones, store them in the refrigerator door, which leaves the coldest spots of the fridge for items that really need the space. Garlic: Store garlic in a paper bag in a cool, dark spot, and it holds its wonderful flavor for weeks. Hot sauce: Make more room in your fridge, and store hot sauce in your pantry — even after it has been opened. All the preservatives and spices keep it safe for topping your eats. Spices: Ground spices do not need to be refrigerated. Ever. Coffee: Many think coffee deserves a special place in the fridge or freezer, but it actually is best at room temperature so its natural oils can really flavor your favorite cup of joe. Buy in small batches for really fragrant, and rich, morning coffee. Soy sauce: Yes, there is more than enough natural preservatives (salt) in soy sauce for it to remain safe if stored at room temperature. Some salad dressings: Just like other condiments, most salad dressing, especially ones that are vinegar- or oil-based, are just fine stored outside the fridge. Cream-, yogurt-, or mayo-based dressings should be stored in the fridge. Nuts: Nuts are just fine stored in a cool, dark spot. Dried fruits: No need to refrigerate. Nope. Cereal: Cereal is wonderfully happy in the pantry. Vacuum-packed tuna: You might not be sure, but that tuna has been sealed, just like in a can, so it’s more than fine stored at room temperature. Herbs: If you pick up fresh herbs from the grocery store, instead of stuffing them back in the suffocating plastic bag, place them in a water-filled glass jar on your kitchen counter, creating an herb bouquet to use while cooking. Real maple syrup: As with honey, that maple syrup will crystallize and get goopy if stored in the fridge. Are there any other foods you find are better outside of the fridge? That’s a great list. I knew about a lot of them from my mother who grew up on a farm during the Great Depression when refrigeration was iffy at best. I’ve always wondered anyone saw a need to refrigerate straight vinegar and oil dressing since you don’t refrigerate those items before mixing them together. Now here’s something a friend of mine who lived on a boat for a year told me about – fresh eggs. But ONLY if they’ve never been refrigerated before which of course in the stores here, they are. I do everything as my mum used to… 🙂 eggs are also in the fridge! Great idea I’ll try to find another sport for them then, let’s free up some space in that small fridge of mine!